Browsing articles tagged with " fabbing"
A continuación os dejo unas reflexiones publicadas en Paramétricomutante el blog de Oblomobka. A partir de ahora colaboraré en la producción de reflexión y contenido en este blog sobre fabricación digital. Oblomobka es un taller/estudio que trabaja mezclando técnicas modernas de fabricación digital e impresión 3D con procesos de manufactura artesanal. Detrás de esta interesante iniciativa se encuentra Jorge Medal, un buen amigo que además es artista, prosumidor de video y objetos, bloguero y diseñador industrial. Durante los meses de febrero y marzo he investigado y escrito sobre el ecosistema de fabricación digital y los fab labs en España y Europa para complexitys.com. El movimiento de los fab labs se funda en la hipótesis de que la creciente socialización y democratización de los procesos de diseño y fabricación tendrá grandes consecuencias a nivel económico, social y cultural. La red global de Fab Labs construye conocimiento y experiencia en diseño y fabricación digital compartiendo infraestructuras y sistemas de comunicación. This post is the fourth of 4 posts about Digital manufacturing (fabbing) environments that we have been publishing weekly on Fridays. In these posts I have shared my research on fab labs, open innovation and smart cities, mainly in Europe and in Spain. This post is the second of 4 posts that are going to be published weekly in the next 4 Fridays about Digital manufacturing (fabbing) environments. 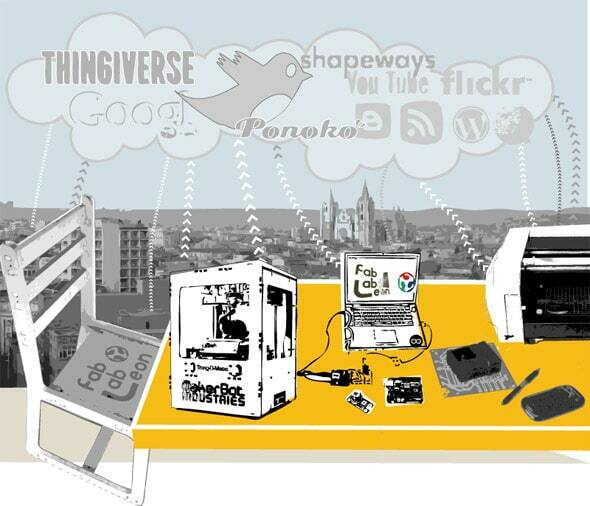 In these posts I will share my research on fab labs, open innovation and smartcities, mainly in Europe and in Spain. This post is the first of 4 posts about Digital manufacturing (fabbing) environments that are going to be published weekly in the next 4 Fridays. 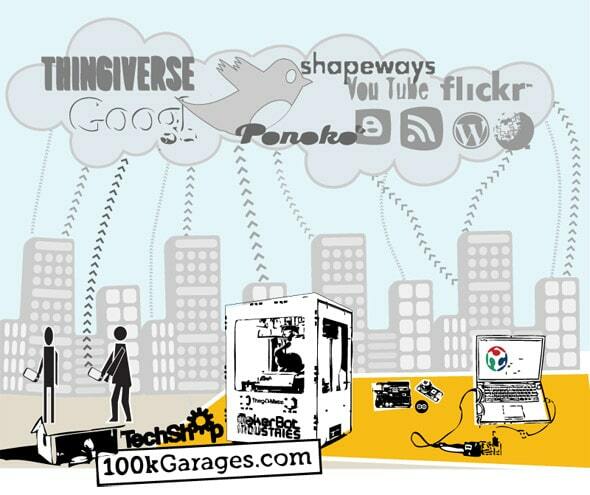 In these posts I will share my research on fab labs, open innovation and smartcities, mainly in Europe and in Spain. Surfing on the Internet this week I found Daniel Davis blog Digital Morphogenesis. I bumped into his last post HTML5 & WebGL where he introduce us on WebGL and why is it important to Cad. I am not an expert on these topics and Daniel’s article really help me to understand what’s going on. So that is what I am going to share with you. Using a browser that supports WebGL means that “users don’t need to download or install any additional plugins to view 3d content”. 3d models are now viewable on the Internet and we are able to generate a model, modify it and design it on the cloud. Have a look at shapesmith, 3dtin or tinkercad. 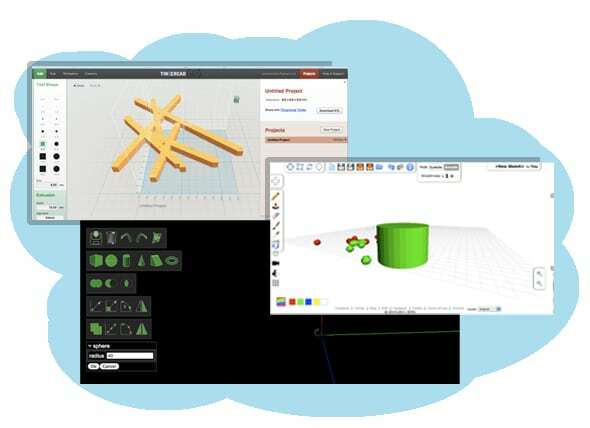 Daniel’s article points out some interesting examples of cad applications that we can find on the cloud computing context. Looking through those examples I found CloudScad. CloudSCAD is now Open Source and available on GitHub. This does not mean that I am abandoning it. If anything I’m in a position now where I’ll probably have more time to work on it. However, after the success of splitting off Thingiview from CloudSCAD and all the great feedback and development that has happened as a result of open sourcing Thingiview, it seems like the best plan. Developers: take a look at the TODO list if you’d like to help out! CloudSCAD is pretty simple at the moment, but I believe it has great potential. Now everyone can help make it awesome! At CloudsCAD’s blog we have this video about personal production. The video was created by nueve ojos for the “Laboratori de Fabricació” exposition at Disseny HUB Barcelona museum on june 2010. We can find more information about personal production at this video-lecture Online Interactive Design and Customization at DHUB. The lecture show two projects about integration of digital technologies into art and craft practices: fluid-forms and automake. This was a little presentation of a very interesting topic that needs more than one little post, so I supposed we will be back to this point soon. At present I only have questions to resolve. Would we be designing with WebGL CAD software in the future? Would we be able to design architecture with this software? Hoping it made you discover something new, I wish you good surfing on the net. Sources: nzarchitecture, CloudSCAD, Disseny Hub Barcelona. Artículo realizado para http://complexitys.com/ en mayo 2011.